Auto parts market size continues to grow online. Sales of auto parts & accessories continued to climb in 2015, and will continue the trend into 2016 to reach $7.4 billion dollars, posting around a 16% increase over 2015. Note: this article is from January 2016. For an updated forecast, click here for a more current article. How big is the automotive aftermarket industry? Ecommerce auto parts sales will narrow the gap with traditional brick and mortar retail sales in 2016, and reach $7.4 billion excluding auctions and used parts. 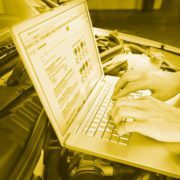 Ecommerce auto parts sales are projected to grow about 16% in 2016. The Automotive Aftermarket Suppliers Association (AASA) Joint Channel Forecast Model projects conventional retail do it yourself (DIY) sales to grow 3.5% in 2016. 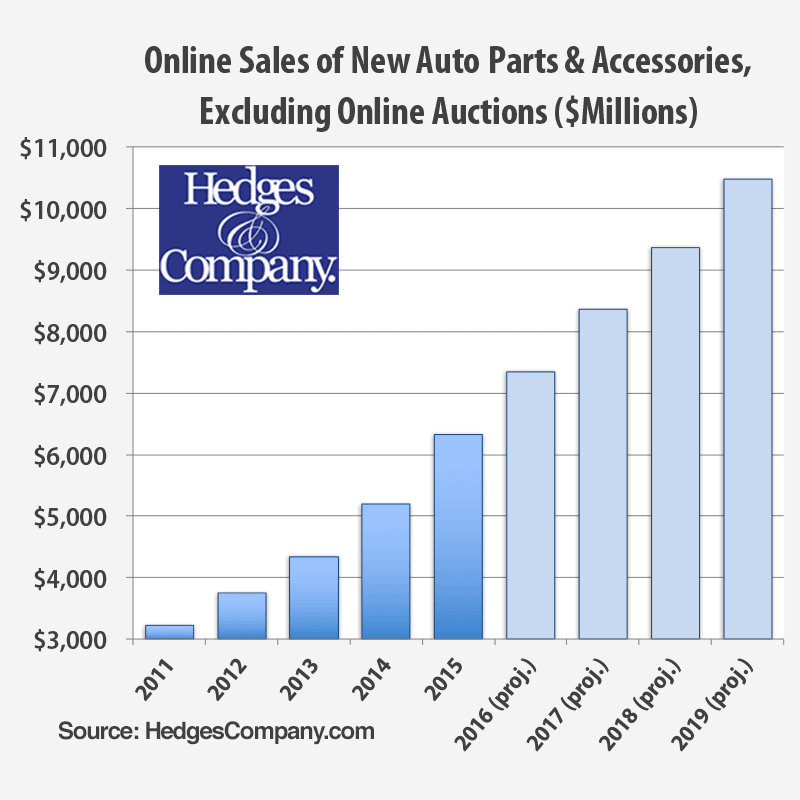 The size of the online auto parts market—sales of automotive and truck parts & accessories—is getting significantly larger each year. This includes OEM replacement and aftermarket parts sold online, typically by Auto Care Association/AASA members (OEM replacement) and SEMA members (aftermarket parts & accessories). Our previous forecast for 2015 was bumped up, as the auto parts industry posted $6.3 billion in online sales. The year came in higher than originally projected, partially due to the strength of Amazon auto parts sales. The Amazon juggernaut continues to be the automotive aftermarket’s largest single online retailer. Another mega outlet for auto parts is eBay Motors, but we don’t include those auction or fixed price sales in our annual numbers since that would result in double counting (see details below for further explanation). Online sales of auto parts in 2015 (excluding auctions, third party marketplaces and used parts) posted around a 21% increase over 2014. Online sales in 2015 were double what they were in 2011, a mere four years ago. Comparing ecommerce sales to traditional brick and mortar sales, the difference in growth is stark. According to data from the US Census bureau, 2015 sales through auto parts and tire stores will show just under a 1% increase from 2014. This is a preliminary projection because November and December sales data is not yet in as of this writing (mid-January 2016). At right is a chart showing the annual growth in sales through auto parts stores since 2001. 2015 is projected to end up with less than 1% growth over 2014. 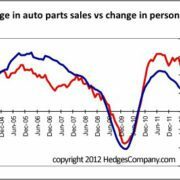 If 2015 finishes as expected that will be the lowest growth rate since 2009, which was actually negative as the auto parts industry came out of the Great Recession of December 2007-June 2009. As of this writing, November and December sales data is not in yet. One variable is the mild winter most of the nation experienced in November and December. That isn’t good news for winter maintenance parts like batteries or antifreeze, but traditionally a mild winter is good for performance parts and accessory sales. 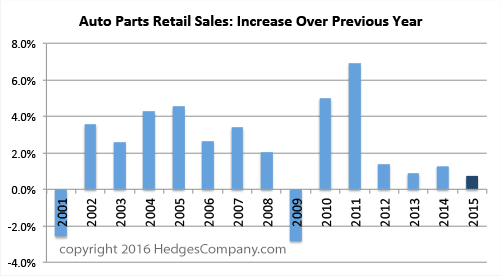 Hopefully the mild winter at the end of 2015 will help boost overall brick & mortar auto parts sales. 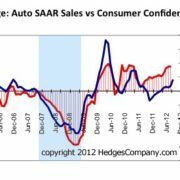 Hedges & Company is forecasting annual sales growth of 12% to 16% over the next four years. Each of the next four years will break a new billion-dollar barrier. Online sales in 2017 are projected to hit $8.4 billion, with approximate $1 billion increases each year. Online sales are currently projected to break $10 billion in 2019. The universe of all online retail sales, not just auto parts, is showing massive growth as well. The U.S. Census Bureau shows that eCommerce represented 6.8% of all US retail sales, January through September 2015. That compares to 6.0% for the same time period in 2014 and 5.4% in 2013. The Census Bureau also reports that eCommerce sales dollars grew 15% over 2014, January through September (4th quarter eCommerce sales have not been reported as of this writing). Their Monthly Retail Trade Survey (MRTS) draws a random sample of “10,000 retail firms excluding food services whose sales are then weighted and benchmarked to represent the complete universe of over two million retail firms.” Fourth quarter data will be released February 17. The industry is talking a lot about omnichannel retailing, or what the direct marketing industry has historically referred to as multichannel. Many consumers do research online and make purchases in brick & mortar stores, and vice versa. “Showrooming” is when a consumer does research in a store then purchases auto parts online. “Webrooming” is when a consumer researches auto parts online and makes a purchase in a store. This behavior is important to be aware for several important reasons. Here are a couple: First, your online presence and buying process needs to be in sync with any brick & mortar location you may have. 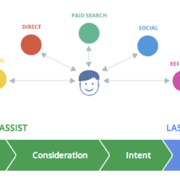 Second, here’s a secret the direct marketing world has known for years; multichannel customers tend to be more profitable customers than customers who shop through just one channel. We’ve tracked online auto parts sales closely each year since 2007 and use a combination of industry research, trends analysis, U.S. Census data, interviews with industry sources, analysis of third-party data and statistical modeling. In our annual forecasts, we count online sales of new and remanufactured auto parts and accessories. 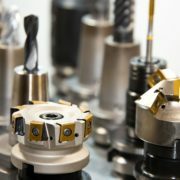 We exclude used and recycled parts as well as online auctions such as eBay Motors. We also exclude sales through third party “marketplaces,” a rapidly-growing online sales channel, where third party sellers sell through Amazon (separate from direct sales through Amazon), Newegg, Sears, and other sites. For this analysis we consider eBay and most marketplaces to be sales channels and since many online retailers also sell through those sales channels, including them would result in double counting. Including auctions would also include individuals selling used parts. We only include Amazon auto parts sales made directly by Amazon itself. This article is copyrighted, but is licensed under a Creative Commons Attribution-ShareAlike 3.0 Unported License and can be distributed or quoted with credit given to Hedges & Company.